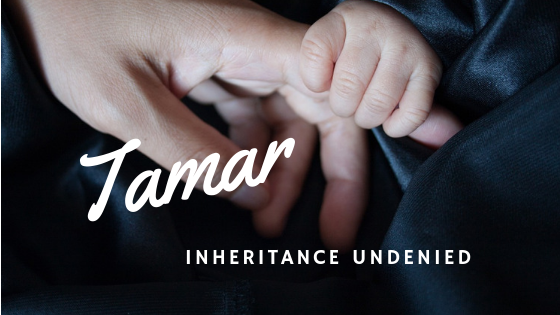 Tamar, Contending for Her Inheritance! A Woman Who Would Not be Denied! Meet a contender wrestling with cultural inequality to secure her inheritance. Tamar would not be denied life, dignity and destiny. Tamar is the first woman listed in the genealogical record of Jesus the Messiah. What merited Matthew’s inclusion of this incredible woman? God intends for man to take his place as defender, protector and provider of his household, walking faithfully before Him. What happens when men stumble and lose their way? When deliberate choices to abandon personal identity, home and family invade, then what? Genesis 38 begins with the words, “at that time“. What time is “that time”? “At that time” when Judah was involved in a jealous conspiracy to kill his own brother, eventually selling him into slavery. It was “that time” when lies couldn’t conceal sin or soothe a father’s grief. “At that time” when guilt haunted and self condemnation screamed. Little words containing enormous ramifications! Judah “left”! Running away from his family, he hoped to escape himself. He “went down” the well-travelled road ultimately leading to dead ends. Judah withdrew from more than his family, however. He crossed God’s boundary line of protection by marrying a Canaanite woman. Together their marriage produced three sons: Er, Onan, and Selah. Tamar enters the picture as the wife chosen for Er. Er was “wicked in the LORD’s sight“, so wicked God “put him to death.“ (38:7). Are there any willing volunteers to take Tamar’s place? Instead of the fulfillment of a little girl’s dream of happy marriage, Tamar found herself in a painful nightmare. Judah instructs his second son to fulfill the Levirate marriage requirement to ensure the continuation of his brother’s family line and protection of his widow. Onan also was “wicked” (38:10). He was all too happy to use Tamar for his own sexual pleasure while refusing to fulfill any obligation to her, his family or God. Stubbornly refusing to face his own sinful heart or the blatant wickedness of his sons, Judah casts all blame toward Tamar. Sin is never “private”! It’s twisted deception infects and affects everyone! An hollow empty promise, to be sure! With a word, Judah cut Tamar from her inheritance pushing her out of his sight — a widow, childless and vulnerable. Her story unfolds like a soap opera! Tamar waits! Years pass! Still she waits. Tamar means date palm, the ultimate symbol of life and productivity. Her confinement concealed the true destiny and calling within her name! Would she settle as castaway? Would she bare the burden of another’s sins in powerless obscurity? His daughter-in-law was granted no such grace! Because of Judah’s unwillingness to give his youngest son Shelah to Tamar, he alone could fulfill the Levirate Law. With courage and boldness, Tamar veils herself and waits by the road, risking all to defend her family rights. for she had covered her face. Judah’s journey took him further than he ever thought possible! The cost was incalculable! This account of Judah is nestled within Joseph’s larger story. A young goat’s blood was given to convince his father of Joseph’s staged death. Now Judah reaches into the flock a second time to mask another dark deception. Judah promises a goat as payment for her services — a payment woefully lacking! Not searching to satisfy lust or fleshly desire, nor seeking revenge for gross injustice and mistreatment, she asks only for what is due her. Boldly she claims her inheritance! and the staff in your hand,” she answered. The seal was a symbol of a man’s identity marking his personal worth, while the attached cord symbolized the binding of two things together. The staff in Judah’s hand was far more than a walking stick! It was an emblem of his authority, like a royal sceptre. It was probably hand carved; the length carefully etched with the names of his ancestry. Yet Judah willingly placed everything into the hands of an “unknown” woman! For one moment of sexual pleasure, he yielded his identity, authority and generational inheritance. Astonishing! Judah later sent his friend with the goat to pay the woman and retrieve his pledge. Unable to find her, his friend returns empty-handed. “Let her keep what she has?” Judah flippantly disregards the value of what has been lost. Nonetheless, words prophetically spoken. Tamar became pregnant in the encounter. The life growing within her forming the connecting link between Abraham and Jesus. The promise protected in her womb outweighed any treasure in her hand! What could satiate a man’s tormented mind and heart? Public disgrace? Cruel aggression? Murder? Tamar’s strength of character and honour toward a man unworthy of such kindness overcomes. No public accusation of his failure! No shaming the guilty or demanding justice! Tamar privately presents the evidence and leaves the result to God. Judah is humbled by Tamar’s integrity, wisdom, and bravery. Within her, Tamar carried a double portion — two sons! One of them, Perez, would carry the DNA of his courageous mother who refused to forfeit her destiny. The DNA of a woman worthy of inclusion in the bloodline of the Messiah! Tamar spurned the victim’s stool! She disdained the wicked example of those around her. By living above reproach she saw fulfillment of her destiny. Without compromise, she humbly followed the God others openly rejected. Her reward? Her name forever written in God’s record of great women. Tamar modelled godliness in ungodly circumstances. Will her example of contending for inheritance be duplicated in our day? Who among us will choose integrity and honour in the face of injustice? Who will lay claim to the spiritual blessing available for this and future generations? Is there anyone who will stand against the cultural currents bringing Christ to the world today? Tamar presents a challenge worth considering!